These have been two of the most important days in the life of Bradley John Murdoch. 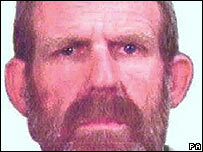 The mechanic from Western Australia is accused of killing the British tourist Peter Falconio on a lonely outback road in July 2001. Mr Murdoch has finished giving evidence at his murder trial in the Northern Territory Supreme Court in Darwin. A guilty verdict would be devastating. He is 47 years of age, and a life sentence could see him die in prison. He has claimed that he has been framed, that DNA evidence has been planted to incriminate him and that the police have got the wrong man. After hearing from 80 prosecution witnesses, Mr Murdoch has finally had his say. The defendant is a tall, burly figure. He is a little overweight, has short greying hair and speaks with a broad but slightly gruff Australian accent. Mr Murdoch admitted in court that he was a drug smuggler who transported 'large quantities' of cannabis through central Australia. He carried firearms but he was adamant that he was not a killer. This week the court has seen two sides of the man known to his friends as Brad. In the witness stand he has responded with confidence to questions from the defence and frequently turned to address the jury directly. It was a composed display as he insisted that he had nothing to do with the murder of Mr Falconio or the assault and abduction of his girlfriend Joanne Lees. However, under a robust cross-examination by the chief prosecutor Rex Wild, the accused was at times clearly frustrated but eager to show he would not be intimidated. Watching intently from the packed public gallery was Ms Lees. She had tears in her eyes during some of the defendant's testimony. At times her home in East Sussex, where she works with people with learning difficulties, must have seemed very far away. The 32-year-old gave evidence at the start of the trial more than six weeks ago and has sat in court ever since. She identified Mr Murdoch as the lone gunman who attacked her and murdered her boyfriend as they drove up the Stuart Highway that runs up through Australia's parched interior towards tropical Darwin. The prosecution has alleged that after Mr Falconio was shot dead, the defendant wrapped the victim's head in a denim jacket belonging to Joanne Lees to stop blood staining the inside of his truck. "No, I did not" was the reply from the accused, one of a series of firm denials to allegations raised by the prosecution. The jacket has never been found. Mr Murdoch has insisted that he was more than 600 kilometres (370 miles) away in a remote corner of the outback when the British travellers were attacked north of Alice Springs. He has also rejected a suggestion that he kept one of Ms Lees' hair ties as a souvenir of the attack. It has been an uncomfortable time for members of Mr Falconio's family, who have also been watching this case unfold. The missing man's mother Joan and father Luciano are supported here in Darwin by their son Nick. They are courageous people - ordinary folk from the north of England who have been caught up in a world of grief and uncertainty. The body of 28-year-old Mr Falconio has never been found despite one of the most exhaustive police investigations ever seen in Australia. These are also difficult times for those close to the defendant. His elderly father died earlier this year. Mr Murdoch's middle-aged partner, Jan Pittman, has also been in court offering her support. This absorbing yet painful trial appears to be coming to an end. In a matter of days the jury of six men and six women, who have been sitting along with three reserves, is expected to be sent away to consider its verdict.